Shop the latest musthave jumpsuits & playsuits! Jumpsuits are always oh-so-flattering. Featuring a multi-stripe material, belt detail that cinches in your waist and a wide leg - you really can't go wrong. Team with black strap heels for your weekend attire. This playsuit is the perfect pick for your weekend look. Featuring a green cotton material in a military style with a belt that cinches in your waist, what's not to love? Team with gold accessories and heels or sandals for a look we're obsessing over. This playsuit is the perfect pick for your weekend look. Featuring a grey material in a shorts style with an attached belt that cinches in your waist, what's not to love? This playsuit is the perfect pick for your weekend look. Featuring a black cotton material in a military style with a belt that cinches in your waist, what's not to love? Team with gold accessories and heels or sandals for a look we're obsessing over. Playsuits are a style staple. For all in one styling, this white playsuit featuring frill trim & tie front is a wardrobe musthave! Wear with heeled sandals & statement earrings for effortlessly cool vibes. Add some prints to your weekend look with this super cute playsuit. Featuring a black material in a floral print, a cut out neckline and 3/4 frill sleeves. We love this teamed with strappy heels and a mini clutch. 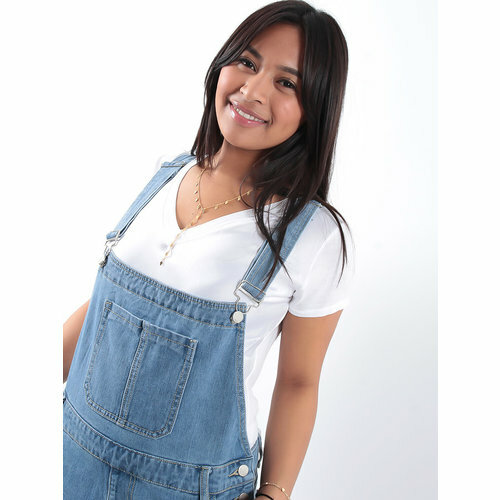 We are loving all things denim this season and these overalls are at the top of our hitlist! Featuring a mid wash denim colour, these are perfect teamed with a logo tee and white chunky sneakers. Looking for the perfect party outfit? We got you covered! Featuring a navy colour with belted waist detail and button fastening at the back. Add heels and a clutch for glam vibes.. Looking for the perfect party outfit? We got you covered! Featuring a vibrant pink colour with belted waist detail and button fastening at the back. Add heels and a clutch for glam vibes.. Your new summer essential! This pleated tie waist jumpsuit in a gorgeous blush pink colour, team with some sandal heels for the ultimate summer look! Your new summer essential! This pleated tie waist jumpsuit in a glamorous black colour, team with some sandal heels for the ultimate summer loving' look..
Jumpsuits are the ultimate statement style. The all-in-one garment creates a striking look. Be a picture of perfection wearing this snake print jumpsuit featuring back zip fastening and tie waist detail. You can't go wrong with a black jumpsuit. Featuring a black cotton material, belt detail and wide leg fit, we love this teamed with casual black sandals for a look we're obsessed with! This playsuit is the perfect pick for your weekend look. Featuring a white cotton material in a shorts style with an attached belt that cinches in your waist, what's not to love? Team with gold accessories and black boots for a look we're obsessing over. Forget the dress - this season is all about the practical and effortlessly put together all-in-one playsuit/jumpsuit. Playtime starts now – so be sure to explore our playsuit collection online today!